This has maybe been the busiest two/three weeks of my life yet, and blogging hasn't been possible. But I will be back soon! I miss my new passtime! P.S...I know I look tired in this picture. It's cause I can't wear any eye makeup due to lasiks. I'm actually quite healthy, so don't worry Mom. I think you look just fine in the picture. I can't wait to hear what is going on in your lives. I love reading your blog, Suzanne. You have such a knack for writing. what a beautiful family! did the lasiks go ok? we miss y'all!!! i'm still in Nashville but hope to go home tomorrow. it has been a long 2 weeks for us, too. What a great looking family picture! I'm amazed that you're all looking at the camera and all appear happy! Suzanne, you look beautiful w/o makeup. I'm jealous. I miss my pasttime also! I hope to get back to it in the next week. We traveled over the holidays, got stuck in Chicago for 2.5 days without bags! (including Christmas morning). McKenna got the stomach flu on the last day of our trip to AL. Got home and unpacked, took down Christmas, still trying to put away and find places for new toys and preparing for McKenna's birthday party this Saturday....which by the way is challenging because she wants a spy party! Ug!!! Hey, Suz! 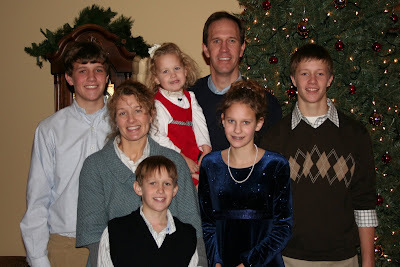 Your family picture is just great: Can't believe how grown up the boys are and how beautiful your girls are. You are blessed, friend, and we miss spending time with your blessings! You got Lasiks?! WOW! I would love to hear more about that sometime, as I would LOVE to get away from contacts and coke-bottle glasses forever! Miss you - pass on our love to your T, A, Z, K, T, and L!